If you use any of our photos, in any way, you must give credit to "Homestead and Gardens" by using a link that directs to www.homesteadandgardens.com. Basil is one of the most loved culinary herbs. 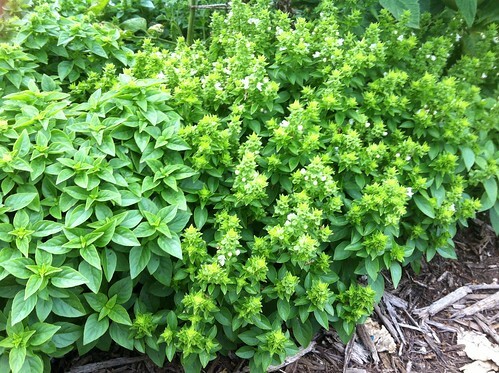 Its scent and flavor are said to be somewhat grassy with a hint of anise. It's used in many dishes. There are many cultivars (cultivated varieties) of basil, and some, such as lemon basils, are bred to contain a higher content of certain oils, so as to produce a stronger flavor of one kind or another. With so many different kinds of basils, they grow in many different sizes and shapes, and producing varying flavor and aroma.